After Tuesday's loss to the Padres and a 17-of-24 losing stretch led Giants manager Bruce Bochy to invoke Murphy's Law, Wednesday night's 2-1 victory at AT&T Park was a more pleasant reminder that sometimes things do go the way they should. Carlos Beltran, the Giants' biggest Trade Deadline acquisition, hit a huge, tiebreaking homer. Brandon Belt, the franchise's top hitting prospect who has been tossed between the Majors and Minors for much of the year, played like a big leaguer. And Tim Lincecum, San Francisco's ace and two-time Cy Young Award winner, threw eight strong innings and rightfully received his 12th win of the season. "We needed that," Bochy said, though the Giants still trail the D-backs by two games in the National League West. "With what happened yesterday and our struggles here recently, it takes a great pitching effort, and hopefully that gets you back on track." Lincecum labored through a 27-pitch first inning but remained effective until his final pitch, a 92-mph fastball to strike out Jesus Guzman. Despite walking five batters on the night, Lincecum allowed only one run on four hits and struck out seven, lowering his ERA to 2.46 -- one one-hundredth of a run lower than teammate Ryan Vogelsong (2.47), who starts Thursday night's series opener against Houston. Lincecum managed to get through eight innings, doing his part to preserve a bullpen that is without its two best late-inning relievers (Brian Wilson and Sergio Romo) and has been worked hard lately. "His count was up there a little bit, but he said he felt great, and he pitched like it," Bochy said. "Timmy did what he does best, and that's make great pitches when he has to." After 3 1/2 innings, Beltran broke a scoreless tie with a solo shot to right field off Padres right-hander Tim Stauffer, his first homer since coming to the Giants from the Mets nearly a month ago and struggling through a bothersome right hand strain. The injury had kept Beltran off the field primarily because of its effect on his left-handed swing. But the switch-hitter erased any doubts by drilling a 1-1 pitch from the left side into the right-field arcade. Beltran had his hand wrapped in a heater when he sat in the dugout, and he issued another reminder that he might not be able to play without pain for the rest of the season. "For him to hit a home run his first time back is pretty impressive," Bochy said. "I thought it'd take him a few games to get his timing down, but he got a changeup there and hit it well. ... It's just great to have him back." Following Beltran's first homer at AT&T Park, the fifth inning brought two more firsts for the Giants and, more importantly, an insurance run. Belt led off the inning with his first Major League triple -- a booming shot to right-center field that likely would have been a home run in most parks. Bochy said he thought it would be the first of many, given Belt's gap power and speed on the basepaths. Lincecum then aided his cause, driving in Belt with a single -- his first RBI of the season -- a high chopper over Guzman at first base. Belt finished 2-for-3 with a stolen base. The left-handed slugger is batting .310 (9-for-29) with four extra-base hits since his most recent callup, showing the ability that made many Giants fans clamor for him throughout the season. But Belt said he learned something in every demotion to the Minors, even if it wasn't an enjoyable experience, and he returned to the Majors this time with a focus on consistent production -- and it's paying off. "I see the confidence growing in this kid and that sense of belonging that you need to have up here," Bochy said. "I like his at-bats. He has a good eye up there. He's driving the ball. He's going to hit a lot of triples, I think, because he can run. He has good gap power, and he's going to hit some home runs. But I do see him getting better and better." But the Padres quickly cut the lead in half. Cameron Maybin led off the sixth with a single that second baseman Jeff Keppinger had to dive to stop. Lincecum induced a Jesus Guzman flyout to Keppinger to get the first out but surrendered a triple to Orlando Hudson. Beltran dove for the ball, but it bounced beneath his glove and rolled into the right-field corner, allowing Maybin to easily score from first. Lincecum left Hudson stranded at third and didn't look back, sitting the Padres down in order in the seventh and eighth despite having already thrown 96 pitches in his first six innings. That enabled Santiago Casilla to throw a perfect ninth, striking out two and picking up his first save of the season. But it was Lincecum, o f course, who drew the most praise from the Padres after the game. "The dude is a two-time Cy Young Award winner. He ain't no punk on the mound," Hudson said. "He has a hard fastball, a sharp slider and a good splitter. And he's a workhorse. What did he throw, 120 pitches? "He's one of the elite pitchers in baseball. I can see him walk to the podium and grab a few more Cy Youngs. That's the type of pitcher he is." And he pitched exactly the type of game the Giants needed. HOUSTON -- It was tough to spot the contender over the weekend at Minute Maid Park, which doesn't speak well for the Giants. Their opponent was on pace for a 108-loss season. But there is no mistaking Pablo Sandoval's All-Star swing. A beaten-down Kung Fu Panda delivered when nobody else could, lifting a two-run home run to the opposite field in the 11th inning that sent the Giants to a 6-4 victory over the Houston Astros on Sunday afternoon. Although his right shoulder remained too sore to swing right-handed, the switch-hitting Sandoval mustered up the difference-maker off right-hander Mark Melancon, and local boy Brandon Belt popped a three-run homer as part of a career-best, four-hit afternoon. The Giants used six pitchers and every last muscle fiber to avoid being swept in three games by the team with baseball's worst record. Most vitally, the victory allowed the Giants to inch within 1½ games of the N.L. West-leading Arizona Diamondbacks, who lost their fifth consecutive game. For all their whirlwind of injuries on a dripping, disappointing, challenging and grueling 4-6 trip, it wasn't a widow-maker. 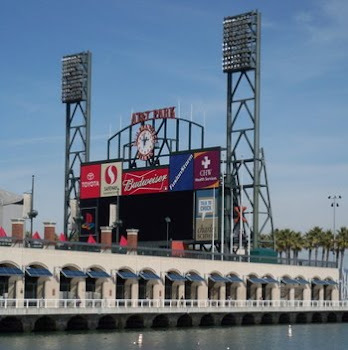 The Giants return home trailing Arizona by just a half-game more than when they left the cooler climes of AT&T Park. Torture? Sure. But there's a different one-word motto this season: survival. "The best way I can put it is, we survived," said Giants manager Bruce Bochy, who looked as if he needed his vitals checked. "It wasn't great by any means. To win the last one, we survived it. We're not too far back, for which we're fortunate. We know it. "That's one of the hardest-fought wins I think I've ever been involved in." It started off promising enough. Belt hit his three-run shot in the second inning to delight his friends and family, many of whom wore T-shirts with a baby giraffe -- his clubhouse nickname -- and a "Keep Belt Awkward" slogan. "I was hating life yesterday," said Belt, who was 0 for 4 and once lost track of the outs Saturday. "I was so eager to see all my friends and family, and I didn't do so good. I came in today and just wanted to clear my head and put the bat on the ball. If I can keep it that simple, that's when I'll be at my best." Belt's home run off former minor league teammate Henry Sosa was the Giants' first three-run shot since Brandon Crawford hit one July 2. Before that, they hadn't hit a three-run homer since Freddy Sanchez on June 2. In addition to filling their monthly quota, the homer provided a margin that had been safe all season. The Giants entered the game 32-0 whenever they held a three-run lead. It wasn't that easy, though. For all the offensive ineptitude that Bochy has witnessed this season, nothing turns his size 8﻿1/8 cap into a pressure cooker more than when his pitchers issue walks. Spot starter Dan Runzler issued three of them, including one to Sosa, and checked out in the middle of Houston's four-run second inning. "Now you're beating yourself," Bochy said. "We knew it'd probably be a bullpen day, but I didn't think we'd start in the second inning." Belt's single contributed to the Giants' tying rally in the fourth, when Mike Fontenot's sacrifice fly scored Nate Schierholtz. But the Giants couldn't push ahead. An invisible force field seemingly kept them from breaking a tie as they stranded seven runners over the seventh, eighth and ninth innings -- with each missed chance more calamitous than the previous one. Sandoval, batting lefty-on-lefty, struck out to strand two runners in the seventh. The Giants also saw Schierholtz thrown out trying to score on a moderately deep fly ball in the eighth; Schierholtz flied out with the bases loaded in the ninth. But the Giants bullpen held firm. Jeremy Affeldt survived a bases-loaded, one-out jam in the ninth to force extras and give Sandoval another chance. A day earlier, Sandoval said he felt "like (crap)." "I still do. I'm tired," he said, nursing a badly bruised foot, too. "I just look for one pitch. I got it. This is for us. It's important for us." Bochy said nobody needs Monday's day off more than his All-Star third baseman. "Well, early on he looked like he felt," Bochy said. "You know I love Pablo. Those last two at-bats were good ones. That's what you hope your 3-4 hitter does for you late in a ballgame." Late in a season, too -- one in which the banged-up Giants, amazingly, are still relevant. "We're strong," Sandoval said. "We've got a new team. Guys are playing hurt. The team we've got, if we keep playing like we did early, we'll do a lot of things. We can get there again." TLANTA -- What emotions does it stir to know that Tim Lincecum is an 11-10 pitcher? Anger? Despair? Liquid hot volcanic outrage? Lincecum sure appeared to bubble, simmer and seethe on the bench during the ninth inning Thursday night, as the Giants put the futile, finishing swings on a 1-0 loss to the Atlanta Braves. But afterward, in front of notebooks and microphones, he was placid, earnest Timmy. "Regardless of it happening consistently, or on an everyday basis, it doesn't matter," he said quietly, after losing on Chipper Jones' home run in the fifth inning. "You've got to compete with what you have on a given day. I seem to have a knack for giving up that go-ahead home run. If I can just eliminate that, I'm sure we'd be a lot more successful." The obvious follow-up point: Almost any home run Lincecum allows is a go-ahead shot. For the 10th time in his 25 starts, the Giants failed to score one measly run for their two-time Cy Young Award winner. This one was damaging. The Giants dropped three of four at Turner Field, where they've won just once in 18 regular-season series. So much for tightening up the N.L. wild-card race. The Braves hold a six-game edge again. "We didn't have too many guys on base and, really, didn't get too many good swings off," said Giants manager Bruce Bochy, after left-hander Mike Minor and three relievers held a collection of slow bats to five hits. "Even when you're facing good pitching, you've got to find a way to get a run." Lincecum held an opponent to one run or fewer for the ninth time in his past 11 starts. He has a 1.17 ERA in seven assignments since the All-Star break but just a 4-3 record over that span. His 2.53 ERA is third best in the N.L. Yet he's already matched his career high for losses in a season. This is a trail frequently taken by Lincecum, Matt Cain and Co. But has it reached the point where the manager needs to tell them to buck up? "I don't think so," Bochy said. "They've done a great job dealing with that. They can't control it. It's natural, don't get me wrong, to be frustrated. Losing isn't fun. But there's nothing else he can do, other than hit two home runs. "We can't get shut out. That's our fault." Lincecum continued to say all the right things. But is it easier said than done? "Well, yeah, but everybody is frustrated in here," he said. "You can't point fingers at any one person. Today was one of those days. Teams will get shut out. You'll have close games, 1-0 games. You've just got to prepare for your next start and put it behind me. Put it behind us, actually. "I want to go out there and throw a shutout every time I can. Just like all of us. We're perfectionists. That one run is going to be crucial, whether it's ours or the other team getting it." It's usually not Bochy's style to play for one run. Early in the game, he generally prefers mass production to a manufacturing style that involves giving away outs. He didn't play for one run in the first inning, after Cody Ross hit a leadoff double. Orlando Cabrera showed bunt early -- a decision he made on his own -- but ended up swinging away and went down on a called third strike. There was a bit of Bochy's signature buzzard's luck involved. Cabrera barely missed a double in the at-bat when his line drive to right field bounced a foot foul. Aubrey Huff hit a hard out to third base to end the inning, too. Still, Bochy was asked why he didn't have Cabrera sacrifice in the first -- or after Ross hit a leadoff single in the third. "In that situation, no, because I've got a professional hitter up there," Bochy said. "He's a foot away from a double there. No, we took three shots at getting that run in." Cabrera blamed himself, saying, "I really believe if I move the runner, we're still playing right now." The Giants' chances dried up against Minor. They didn't advance a runner into scoring position after the second inning. "We've got to get that mojo back," said Bochy, apparently remembering a time when his hitters actually had it. ATLANTA -- In earlier generations, Matt Cain would have been a test pilot or bare-knuckled boxer. The Marlboro Man or even Dirty Harry might have suited him as a fictional character. Any alter ego for Cain would have to be unyielding, unafraid and uncompromising. Needing Cain's special stubbornness Wednesday night, the Giants received every ounce of it in a 7-5 victory over the Atlanta Braves that plugged a few holes in San Francisco's leaky hull. Cain would not be cowed by the Giants' 13 losses in the previous 18 games. The Braves' one-run, last-at-bat victories in the series' previous two games, as well as their 5-0 edge over San Francisco this season, never entered his mind. Facing an Atlanta lineup that featured power, speed and the ability to hit for average -- "You have to pay attention to those guys all the time," Cain said -- the right-hander took the mound with respect but without fear. Cain allowed five hits and issued one walk to the first 13 Braves he faced. And that was it for Atlanta. Following Dan Uggla's third-inning leadoff double, Cain retired 18 consecutive batters until his eight-inning outing was complete. Displaying a fastball with lively movement, Cain struck out nine, and the lone run he surrendered was unearned. "You definitely try to make quick innings and keep the guys moving, positive and in a good train of thought," said Cain, who ended a personal three-game losing streak. "If that [means] working fast or kind of being laid back in the dugout, you try to find ways to do that to keep guys energized." Obviously, Cain was the man for the job as the Giants narrowed their National League West deficit to 2 1/2 games behind first-place Arizona. Asked if he was especially motivated to prop up his staggering teammates, Cain said, "I think all of the starters do that. The bullpen's the same way, but as starters, I think we put a lot of pride in keeping streaks alive and trying to put an end to streaks when things are going bad." "He's so steady," Giants manager Bruce Bochy said. "He's got that calmness you like out there, both on the mound and in the clubhouse. He's a calming influence, I think, on everybody. He doesn't get rattled. He's competitive -- he has his moments like all of us -- but with men on base or a mistake out there defensively, he doesn't let it bother him." Cain (10-9) responded to the Braves' early challenge by abandoning his windup and working from the stretch position, which enabled him to keep his body balanced and aligned toward home plate throughout his pitching motion. If this sounds familiar, it should. Tim Lincecum often employs this stratagem, which Cain has tried occasionally. "I kind of did take it from him," Cain said. "You have to find different ways to get things going." Braves manager Fredi Gonzalez noticed a definite difference after Cain's switch. "We didn't get very good swings out of him the rest of the night," Gonzalez said. By contrast, the Giants sustained rare offensive productivity. Their four sacrifice flies tied a franchise record previously reached four times, most recently last year. Cain himself launched one of them in a four-run fourth inning against Braves starter Jair Jurrjens (12-5) that snapped a 1-1 tie. Before Cain batted, five Giants in a row reached base safely. Aubrey Huff blooped a double, advanced on Nate Schierholtz's single and scored on Orlando Cabrera's single. Brandon Belt walked to load the bases and set up Eli Whiteside's RBI single. Then came back-to-back sacrifice flies from Cain and Cody Ross. Pablo Sandoval, sore right foot and all, contributed a first-inning RBI double and a ninth-inning sacrifice fly to the Giants' largest scoring output since they whipped Arizona 8-1 on Aug. 3. Ultimately, San Francisco needed each and every run. With Cain having thrown 114 pitches, Bochy inserted Dan Runzler in the ninth inning to get some work, and most of the Giants' 7-1 lead quickly evaporated. After the Giants barely missed turning a double play that would have ended the game, the Braves mounted a genuine threat. Jason Hayward lashed an RBI single, Cabrera dropped Michael Bourn's simple popup for an error that enabled another run to score and Martin Prado drilled a two-run double. Suddenly, Brian McCann was batting, representing the tying run. Huff allowed himself to think the unthinkable -- a home run by the clutch-hitting McCann. "That probably would have killed us," Huff said. With sore-armed closer Brian Wilson unavailable, the Giants survived as Jeremy Affeldt fanned McCann on a 3-2 pitch. "We'll take a win any way we can get it," Huff said. When Jonathan Sanchez was escorted off the Turner Field mound with an ankle injury, it was a fitting touch to the busiest day of the year for the Giants' medical staff. Except for perhaps that ill-fated night in late May in which Buster Posey got pummeled at the plate. That was an isolated case. Tuesday's action was fast and furious, one player after another checking in for treatment or tests, and the Giants were left to face the Braves with only two healthy men on the bench: Mark DeRosa and Eli Whiteside. The roster-challenged Giants collected their usual five hits and lost 2-1 in 11 innings when old friend Brooks Conrad - whose four errors in October's Division Series were a Giants highlight - doubled off Javier Lopez with one out, advanced on a groundout and scored on Martin Prado's single to right. It was the second game-ending hit in two nights for the Braves, who improved their wild-card lead over the Giants to six games. The Giants fell 3 1/2 behind first-place Arizona in the NL West. "As players, it's tough when you see guys (injured), but you can't sulk," Cody Ross said. "We're going through a little tough patch with the injury bug, but nobody feels sorry for us. We've got to step up and play better. We definitely can't start getting selfish." Until Ross' homer in the seventh inning, the Giants had zero hits off Randall Delgado, who was making his second career start as a fill-in for injured Tommy Hanson. Initially, it seemed only Pablo Sandoval (bruised right foot) was a casualty from Monday night's opener. Upon further review, three others were injured: Nate Schierholtz (bruised right foot from a foul tip), Jeff Keppinger (sprained right wrist, in a collision at first base) and Aaron Rowand (intercostal strain, caused on a swing and a throw to the plate). X-rays on Keppinger (who also had an MRI exam) and Schierholtz were negative, and both hope to play tonight, though each was far from 100 percent. Rowand, a surprise entry, grounded out as an eighth-inning pinch-hitter but was unable to play defense. "If all three can't do something (today), we're going to have to make a move," manager Bruce Bochy said. "We can't be this short." Earlier, the Giants put Carlos Beltran and Sergio Romo on the disabled list, replacing them with Miguel Tejada (who played third base) and Dan Runzler (a candidate to start if Sanchez is shelved). In the morning, head trainer Dave Groeschner accompanied Beltran to Cleveland for another opinion and a second cortisone shot. Groeschner was back in Atlanta by the time the game ended, able to assist in the hectic trainer's room. Thank goodness for Sandoval. "He showed up and came right into the office and said, 'I'm playing,' " said Bochy, whose lineup included several players out of position, including Sandoval at first base. Sanchez sprained his left ankle in the third inning. He slipped and fell pursuing Delgado's bunt and was done one pitch into Michael Bourn's at-bat. Sanchez used two crutches to get through the clubhouse but said he hopes to make his next start. "I'll give it two days and tape it up and see how I feel," Sanchez said. Guillermo Mota replaced Sanchez, and Bourn singled home Jose Constanza with the Braves' first run. Atlanta had a chance to win in the 10th with runners at first and third, but shortstop Orlando Cabrera robbed Alex Gonzalez and turned an inning-ending double play. Other defensive gems came from left fielder Aubrey Huff (robbing Prado in the ninth) and right fielder Brandon Belt (catching Freddie Freeman in the 10th trying to get back to first base on a single). After hitting two home runs at Sun Life Stadium on Sunday, Brandon Belt might have a jones to play here again. He can, but he'll need to bring pads and a helmet. With the rookie hitting half of the team's four home runs - yeah, one even with a man aboard - the Giants beat Florida 5-2 in their final game at this park before the Marlins open a new one next season. Cody Ross hit a two-run homer against Chris Volstad in the third inning to end the Giants' record streak of 21 consecutive solos. They had gone 298 innings and 1,217 plate appearances without a multi-run homer. What's that old adage in baseball? When one streak ends, you just start another? The Giants scored their final three runs on solo homers, one by Nate Schierholtz in the fourth and the two by Belt in his first game back from the minors. And, yes, breathless Giants Nation, Belt will start against Tim Hudson in Atlanta tonight. "He'll be out there somewhere," said manager Bruce Bochy, whose skin must be sensitive to pitchforks. "One homer, you're in the lineup the next day. Two is a no-brainer." Nor does it require Albert Einstein's brain to understand why Sunday's win, Ryan Vogelsong's 10th, was so important for the Giants. They not only won a series and back-to-back games for the first time since they visited Philadelphia last month, they gave themselves a running start into Atlanta, where they play a critical four-game series. The Giants could become playoff longshots if the Braves wallop them as they did over three games in San Francisco in April. Belt thus becomes an intriguing wild card at Turner Field after he doubled his season home run total to four. Both shots were impressive in different ways. His first, in the sixth inning, was a tape-measure job to center against the right-handed Volstad. The second, in the eighth inning, was against a left-hander, Mike Dunn, who had not surrendered a home run to a left-handed hitter in the majors in 151 encounters. Moreover, Belt guessed slider on 3-2 and got one. As the Giants have yo-yoed the first baseman between San Francisco and Fresno, and stuck him on the bench even when he was promoted, the fans started a "Free Belt" movement, asking, pleading, demanding that he play every day. Belt would love nothing more, though he will not carry any protest signs into Bochy's office. "I'm tired of thinking what the scenarios are," Belt said. "I want to worry about going out and performing well, playing baseball, seeing the ball, hitting the ball, having good at-bats and playing good defense. If I'm good enough, hopefully he'll play me again and I can stay up here." Belt helped Vogelsong win another game, and Vogelsong helped the team immensely by lasting into the eighth inning on a day in which Sergio Romo and Brian Wilson were not to be used. Bochy said Romo's elbow was "a little cranky" and Wilson's back stiffened. Both ailments were described as minor. Vogelsong allowed a Mike Stanton homer in the first inning and no more runs until Emilio Bonifacio's RBI double in the eighth. Santiago Casilla got a big out to end the eighth, and Ramon Ramirez got the save. Asked what it meant to get his 10th win, Vogelsong said, "Every win is significant to me, after where I've been." Any time you ask Bruce Bochy about the Giants' odd, record-breaking streak of solo home runs, the manager lets out one of his basso profundo groans. "I really know what Earl Weaver meant when he said he liked the three-run home run," Bochy said. "We all do." Weaver also had pitchers such as Jim Palmer, Mike Cuellar and Dave McNally. The old Baltimore Orioles manager would have enjoyed having Tim Lincecum on his side, too. Lincecum busted another losing streak while striking out 10 in seven shutout innings, and the Giants got their three runs in three different innings to pull out a 3-0 victory over the Florida Marlins on Saturday at Sun Life Stadium. A night earlier, Bochy called a clubhouse meeting after the Giants' 11th loss in 14 games, telling his second-place team to straighten up those slumping shoulders and play loose. That's always a bit easier with Lincecum on the mound. "Hopefully it'll get us on a win streak and lift morale in here," said Lincecum, who is 4-2 with a 1.11 ERA in six starts since the All-Star break. "Bochy told us we can't hang our heads. This is going to be the toughest part of the schedule going into September. We need to lighten the mood, just go out and have some fun. "We know where the Diamondbacks are. It's different when you're in the lead. Once they took the lead, it's like we're pressing. We're trying to play catch-up instead of relaxing and playing good ball. "Nothing comes easy, especially if you're thinking too hard about it. You've just got to go out there with intent and do what's asked of you." The hitters didn't exactly bust out. Nate Schierholtz scored in the fifth after an error and a wild pitch, and Aubrey Huff's run-scoring double in the sixth was a pop-up down the line that left fielder Logan Morrison dropped. The Giants' first run, the only one Lincecum would need, came on Jeff Keppinger's first home run as a Giant -- solo, of course. The Giants' 21 consecutive home runs with the bases empty extended a highly undesirable major league record. "Yeah, we're going to try to set a record that's never going to be broken," Bochy said. "We're in relentless pursuit of solo home runs. But you know what? I'll take them." So did Lincecum (11-9), who might be re-entering the Cy Young Award race with a very strong second half. "All our pitchers should be in the Cy Young race, the way they're pitching," Huff said. "Shoot, Timmy could be 20-3 with the Yankees. You can only imagine what they'd do if they had a nice lead." Once again, Lincecum ditched the windup with the bases empty, confident he could find his rhythm better from the stretch. He did, allowing only Emilio Bonifacio's infield chopper in the third inning and Bryan Petersen's single in the seventh. 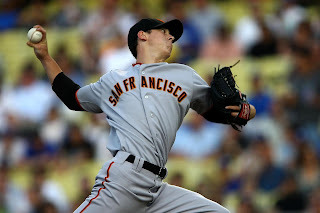 Lincecum promptly struck out his final two batters, showing little effects from the humid, upper-80s heat. Little Timmy used to melt like frozen custard in steamy conditions. Now he's simply fitter and more focused than during his winless August a year ago. "That's where putting on the weight worked to my benefit," said Lincecum, who is known to wolf down three In-N-Out double-doubles in one sitting. "It's not all good weight, but I can retain water a little better and sustain my pitch count." It's also notable that three of Lincecum's four victories after the break have come against managers who questioned his greatness in recent weeks. He twice beat Phillies manager Charlie Manuel, who called him "good, not great." Lincecum wasn't aware of it, but Florida manager Jack McKeon had criticized Bochy for putting the right-hander, then 6-6, on his N.L. All-Star squad instead of the Marlins' Anibal Sanchez. "I don't know if it's proving me right," Bochy said of Lincecum's second-half surge. "He's a guy people want to see, so I had no problems with him being on the All-Star team because he deserved it. But, sure, it's nice to see him show what he's all about." The next question for Bochy: Will he allow recently recalled rookie Brandon Belt, now in his fourth stint with the club, to show what he's all about? Bochy said Belt is "here to help" as a backup first baseman, outfielder and pinch hitter. Pressed on why he wouldn't throw Belt out there every day, Bochy said he has "your guys, veterans you still believe in. I'll do all I can to get him at-bats, because I think we need some help. It'll be up to Brandon to come up and handle this well and give us some good at-bats."